chili – Design Your Lifestyle. In our first breakdown of the Pantone Spring 2018 Color Palette, we introduced you to the brightest shades in this season’s collection. Now, it’s time to let the neutrals take center stage… but trust us, these neutrals certainly aren’t shy about drawing attention. 2017 was, in many ways, the year of neutrals in color design and home design. The days of neutral tones being complementary colors and background shades in home design are long gone. From stunning white kitchens to bold browns and tans (like 2017’s Autumn Maple and Toast) that dominated living room and bathroom design, neutral tones took over the design landscape. The Pantone Spring 2018 color palette features 3 tones that we’re grouping into a “versatile complementary colors” category: Almost Mauve, Emperador, and Chili Oil. While some may take exception with our categorization of Chili Oil, we think this brick red tone is a prime example of the audacious steps that home designers may take with color schemes in 2018 – plus, you’ll find it pairs beautifully as a complementary shade with many of Spring 2018’s brighter color options. The 12 shades selected for the Pantone Spring 2018 color palette (plus the 4 “Classic Colors” listed as an addendum) are a large step for Pantone, the world’s foremost authority on color design and color matching. In recent years, Pantone has released seasonal collections of 10 colors, offering plenty of selection and inspiration for color design enthusiasts. So let’s take a closer look at the 3 versatile colors we think color design and home design experts will be using to balance their design schemes during the Spring 2018 design season! Almost Mauve is the most delicate neutral Pantone’s selected in years. It’s also perhaps the most intelligent selection in the Pantone Spring 2018 color palette. With so many gorgeous, floral pastels in the collection (Blooming Dahlia, Spring Crocus, etc. ), this off-white with a touch of pastel is a gorgeous anchor neutral. Almost Mauve screams “bath design”, with a soft off-white tone that lends itself perfectly to tile design, porcelains and appliances. Don’t be afraid to work with Almost Mauve to create a white kitchen design that comes with a built-in sense of warmth. Much like Otter from Pantone’s 2017 color palette, Emperador is a smart chocolate brown that gives a real “backbone” to the Spring 2018 collection. Just like fashion designers loved Emperador for Spring 2018 accessories on the runway, so too will home designers utilize Emperador as the perfect complementary shade for kitchen design and living spaces. Take Emperador as a cue for anything (and everything) to do with accessories and decor, as well as using rich brown hues in your kitchen’s backsplash, flooring, counters and furniture. Man, do we love Chili Oil. This “brick” color has just enough red to pop and just enough brown to lay back and let other colors dominate. All told, Chili Oil may be remembered as the most versatile shade in Pantone’s Spring 2018 collection when we look back on it. In terms of home design, Chili Oil may signal a simple return to exposed brick concepts. We also think the color works brilliantly as a complementary shade in paint schemes, a smart choice for decor accents and accessories, and custom ranges for kitchen design from companies like La Cornue. Plus, why not take Chili Oil as an invitation to use red-hued wood in your flooring? 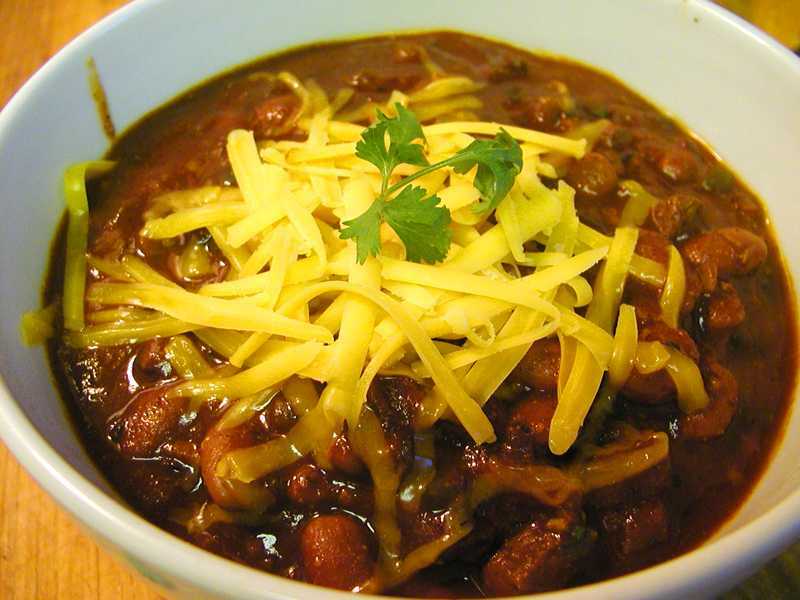 Our Favorite 2015 Tailgate Recipe is This Awesome Chili! Every September, football season gives us two reasons to get excited – some great action, and some even better tailgate parties and food! But with grills and smokers getting more sophisticated, tailgate parties (and their hosts) are always trying to step their game up to have the best tailgate party at the football game. Every year, Peter Salerno and his son, Anthony, go on the hunt for the very best tailgate recipes around. For 2015, their new favorite is a 5-star classic from renowned Food Network chef Melissa D’Arabian, host of 10 Dollar Dinners. An easy recipe that takes just under an hour of prep time and the perfect blend of savory, smoky and spicy notes, this “Game Day Chili” recipe is a knockout for your tailgate party this season. Peter Salerno and his team thank Food Network and Melissa D’Arabian for publishing this awesome chili recipe – we’ve never met, but we love your chili! In a large saucepan or small Dutch oven, cook the bacon over medium heat until the fat renders and the bacon is cooked, about 5 minutes. Add the onion and cook until the onion softens, about 5 more minutes. Add the garlic and cook for another minute. Add the beef and cook until no longer pink. Raise the heat to medium-high, deglaze with the beer, and allow to bubble and boil for 2 to 3 minutes. Add the beans, tomato sauce, crushed tomatoes, chili powder, red pepper flakes, cocoa, and salt. Stir to combine well. Simmer for 30 minutes, or more, and serve with sour cream, shredded cheese, and chopped scallion, if desired.